Public agricultural research staff and spending in Africa increased rapidly during the 1960s. Since then, expenditure growth has stalled for the region as a whole. By 2000, R&D spending in Africa had reached nearly $1.5 billion (in 1993 international dollars). Many individual countries, however, actually experienced a decline in agricultural R&D expenditures during the 1990s when funding became increasingly scarce, irregular, and donor-dependent. Large differences can be observed between African countries. For example, about half of the 27 sample countries experienced negative annual growth in agricultural R&D spending—some in excess of 10 percent per year. In contrast, a handful of countries experienced growth of 5 percent or more per year. Other key indicators show similar discrepancies among African countries. 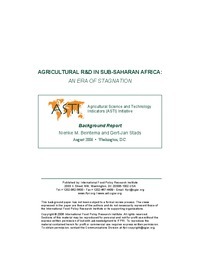 Total donor funding in support of agricultural R&D has declined since the mid- 1990s, often as a result of the closure of large projects financed by the World Bank, USAID, and FAO. Despite waning financial support to public agricultural R&D, the private sector has yet to make a significant contribution. Reliable estimates on private research spending are hard to estimate, but the best (and most recent) evidence suggests that, in 2000, the private sector accounted for only 2 percent of total (public and private) research investments in Africa. Reportedly, most of the private technologies in use throughout the region are based on research conducted elsewhere. One positive development is the renewed interest in regional and subregional approaches to agricultural research in Africa. Through such regional networks, technological innovations made in one country can quickly impact research in other countries with similar agroclimatic conditions, thereby creating an important leapfrog effect. In addition, the CGIAR and other international research bodies have increased their focus in the region, many now having a substantial local presence. Nevertheless, the increased agricultural R&D activities of these alternative suppliers does not appear to have counterbalanced the stalling growth in public agricultural R&D spending. security. New and better targeted technologies are essential to increasing agricultural productivity, as are well-developed and well-funded agricultural research systems. However, the recommendations and growth targets set by the IAC report and NEPAD’s FAAP seem overly ambitious without substantial accompanying funding increases. Doubling Africa’s agricultural research intensity ratio from 0.7 percent in 2000 to 1.5 percent by 2015 as recommended by IAC in 2004 would require average annual growth in agricultural R&D spending of 10 percent. Given that there is no evidence that governments and donor organizations have substantially increased their funding to agricultural research over the 1 percent per year average of the 1990s, this goal can only be considered unrealistic. In addition, based on existing investment patterns, Africa will probably miss out on most of the advances in biotechnology that are currently being made in other regions in the world. Given the continued withdrawal of donor funding, other funding sources will need to be consolidated and further developed to counteract the impending steady erosion of agricultural R&D capacity. In addition, foreign donors and African governments must renew their commitment to financing agricultural R&D, accompanied by innovative funding mechanisms, institutional reforms, and the formulation of sound S&T policies, all of which are prerequisites for improving the efficiency and effectiveness of the region’s agricultural research.